It's a pretty simple plan, really. Step 1: Include video footage of the much-anticipated Dragon Quest X on the main disc (which, in the case of Dragon Quest Collection, also will include the first three Dragon Quest games in their original Famicom forms and the Super Famicom Dragon Quest I&II and Dragon Quest III remakes). Step 2: Mention said footage on the game's packaging (below) and in any and all promotional materials. Step 3: Sit back and watch the title sell by the truckload. Sadly, it's doubtful the folks at Square Enix will be employing that plan anywhere else in the world, as the 16-bit Dragon Quest remakes weren't released outside of Japan. Thankfully, the footage is sure to be shared on YouTube shortly after Dragon Quest Collection hits the streets on Sept. 15. I'd love it if they'd release the collection in NA and Europe with just the NES versions of the first four Dragon Warrior games, but I can't see that happening. Yeah hehe! It'd be really nice =) This series is just one of my absolute favorites, hands down. But yes! So just very excited to finally get something in regards to DQX! The wait has been killing me. It seems like I heave a lot of heavy, longing sighs around here. This one is also head-shake-worthy. WANT. I'm excited, too, damndamndrum! I had soooo much fun with Dragon Quest IX, and I can only imagine how great X will be. Are you talking about wanting the DQ Collection, Justin? If so, I understand completely -- although at least all of these games can be played through emulation and other means. I'd be much more upset if the collection included new remakes of these titles. 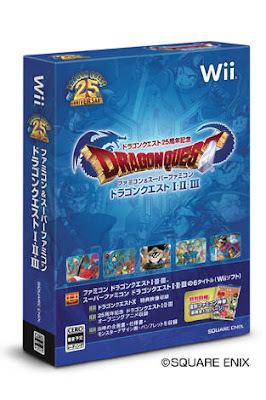 Also, at least we're sure to get Dragon Quest X in the States (and in Europe, etc.). IX sold mighty well thanks to Nintendo's marketing power, after all. Really, for me, the exciting thing about the release of the DQ Collection is that it will give us all an early look at DQ X.
I think it's a missed opportunity NOT to release it over here, as the SNES versions of the first three games especially would probably be something newcomers to the series would be interested in trying out. Since Nintendo is seemingly trying to get DQ more noticed out west, it kind of seems odd that they'd pass this up. Well, we'll get a look at it before it gets here anyway. I can't imagine them just letting it free over here with no news about it. I'm sort of surprised there hasn't been any yet. Oh, I agree, Kamiwoo, that the 16-bit remakes would be attractive to Euro and NA gamers, but I doubt SE will put in the effort. At most, I could see them releasing the collection with the NES versions of the first three games, but I think that seems kind of unlikely, too. I guess we'll see! Yeah, I think we'll be hearing more about DQX before the DQ Collection is released. Maybe they'll release the logo before then, for instance. I'll take any info on the game at this point, really.